The Ancol Leather Tartan Dog Leads shown on this page are screen printed onto premium bridle leather that has a consistent grain and thickness, that are sewn for strength using industrial nylon, instead of riveted, using a unique flag pattern to secure the heavy gauge trigger to the tartan lead. Each tartan leather dog lead is tanned with 100% natural fats, to keep the lead soft, supple and water repellent to help prevent damage occurring to the lead from being folded and placed in a pocket or being exposed to the outside elements, which could result in an inferior leather lead needing to be replaced after a short period of time. Like all ancol leads the screen printed tartan lead, has heavy gauge triggers to compliment the quality and smooth texture of the lead, that is available in two widths 12mm or 16mm for small or larger dogs. 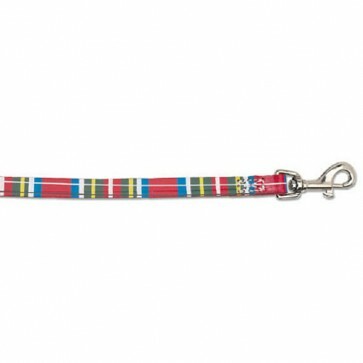 Also available on this website are matching tartan dog collars to compliment your new tartan dog lead. Leather is a Natural material which has a number of benefits, it looks wonderful, is strong and water repellant. However if your dog is guilty of constantly chewing or enjoys swimming, it is advisable to purchase a synthetic fibre such as nylon for both your collar and lead, which are also available on this website.